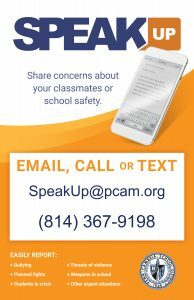 Our goal at PCI is to create a positive environment where students feel welcome and safe. PCI is implementing a program where students can earn a reward at the end of each month for doing something positive that is above and beyond what is already expected of them. If a student receives a “PAW”, the student did something “above and beyond” to exhibit kindness, caring, and positive character. If your child talks to you about receiving a “PAW” you should be very proud! If you have any questions about this program please contact the principal, Mr. Smorto. He is excited about how this program can change the culture of the building in a positive way!